This indoor unit works as part of a multi-split system. 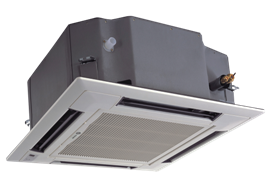 Mounted in the ceiling it offers versatile, high-efficiency heating and cooling for precise comfort with minimum ductwork. Composed of three main components—an indoor unit consisting of a coil and a fan, an outdoor compressor unit and a remote control—most ductless split systems are connected by refrigerant lines and require minimum ductwork. The indoor unit can be mounted on the wall or in the ceiling. Trane’s ductless indoor units have Seasonal Energy Efficiency Ratings (SEER) ranging from 16.00 to 22.00, making the systems remarkably efficient and environmentally friendly. Specially designed air vents efficiently reduce sound to provide quiet comfort as low as 26db, for whisper-quiet operation. Since there is minimum ductwork to install, it’s easy to add Trane’s reliable heating and cooling to any home, in any room desired. It’s an economical and efficient option for homes without an existing ducted system or when adding extensive ductwork may be impractical or too expensive.